Live update from Chesil Beach. I promised you earlier in the week, I would update the site as things changed, and windows of opportunity arose. Well you don’t get much more up to date than a report that I am writing from the beach right now. Conditions were perfect yesterday, and we will talk about them in a moment, but right now the beach could not be more different. As you can see from the picture I have almost the whole beach to myself, and it is flat calm. Unfortunately the colour has dropped out of the water, leaving it almost clear. I was not expecting the colour to change so rapidly. Don’t let this put you off too much, as I believe that there is still plenty of food in the water to draw the fish in. I have already lost one decent fish on the first cast, and had a hit on the second rod, whilst trying to retrieve the first fish. The fish took the rig down tide and managed to find a snag, which I couldn’t get out of. I am using Scollop frills on one rod and the other is baited with fresh Blag Lugworm, which I got from Abbotsbury Tackle. It seems Tom at Abbotsbury Tackle was the only one to predict the window in the weather and made an effort to get fresh bait. Both rigs are Pulley Pennels, with a 2/0 Kamasan on the top and a 4/0 Kamasan on the bottom. I have clipped them behind one of the brilliant Gemini Tackle splash down leads, which I use for most of my clipped down fishing now. The weather broke yesterday as predicted. 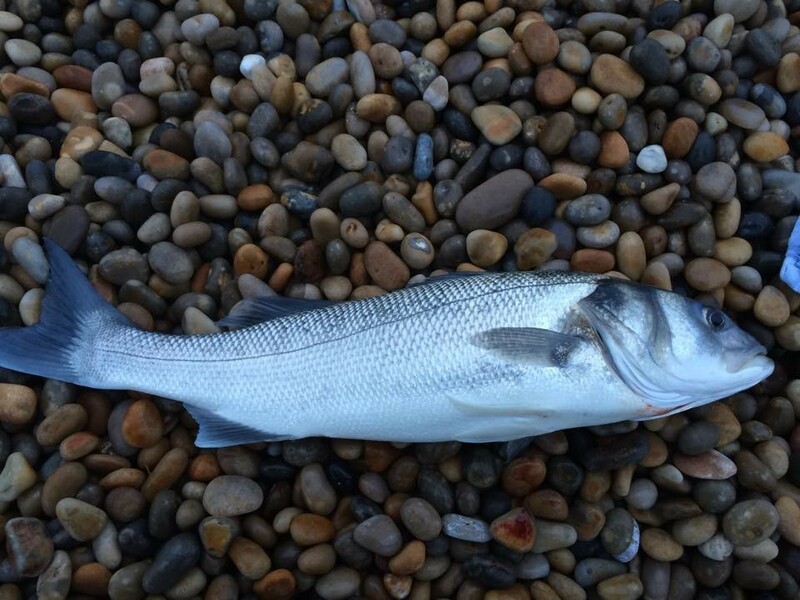 I made a bad call and headed to Hive beach in search of a big Bass, rather than a Cod. What I hadn’t counted for was the weed sitting on top of the reef to the left of Hive, was being ripped off in the rough sea and ending up floating in the water. This made it almost impossible to fish. 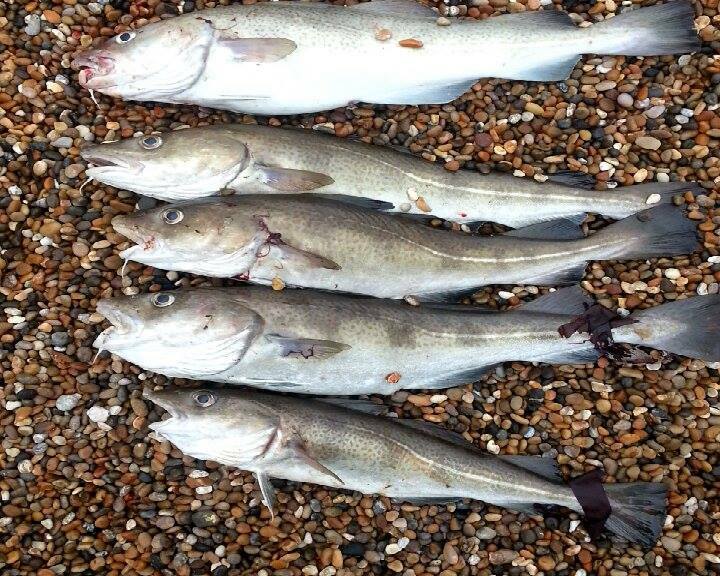 Others made a far better call, with reports of Cod from Abbotsbury all the way to Chesil Cove. Robert Raybold had 14 last night with largest going 7.5lb. All caught on Lugworm from Abbotsbury. 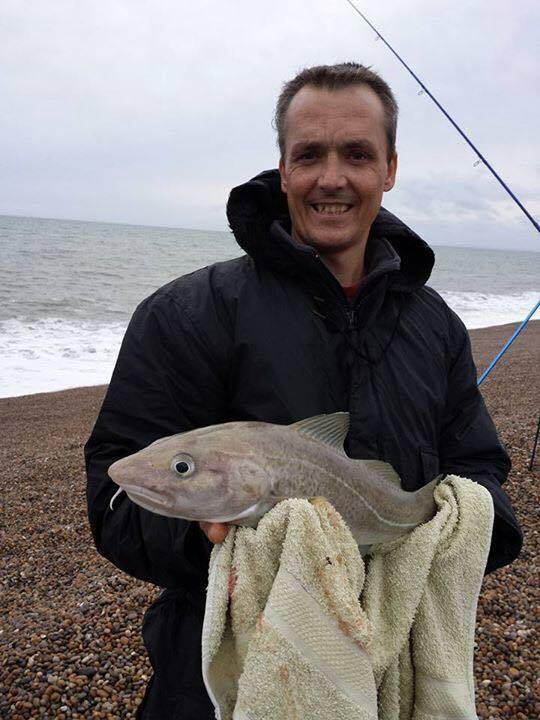 Simon Harris from Weymouth had some nice Cod and Bass for his efforts. Well done all that caught. I hope the fishing is good today, but I see a big band of rain coming in for the next couple of hours. Conditions for the next few days look good, so I will keep the updates coming. For live updates, have a look at my Facebook page. 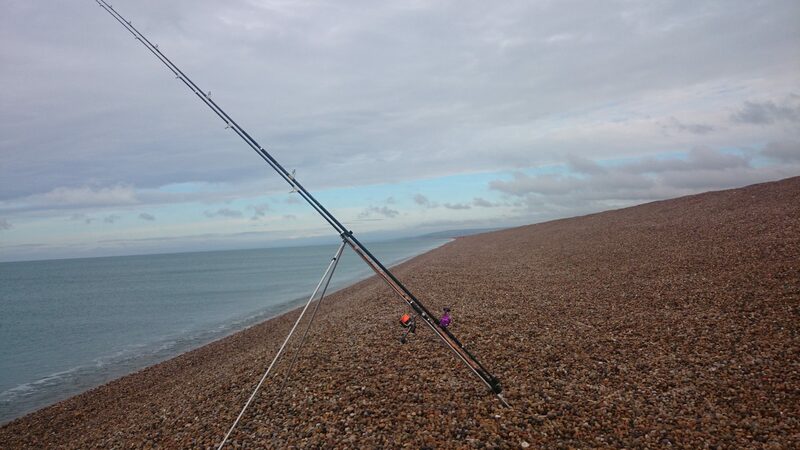 Fishing Tails > All Articles > Reports > Chesil Beach > Live update from Chesil Beach. 20 Responses to "Live update from Chesil Beach." 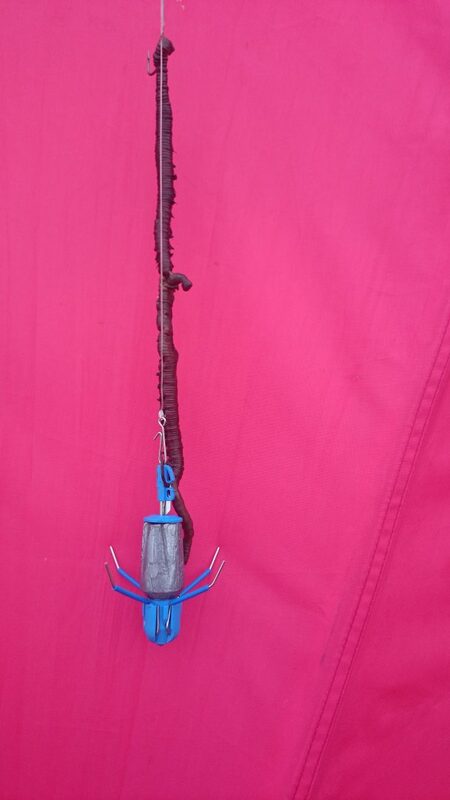 I always read and enjoy your reports “with envy!” With regards to your above pulley Pennell rigs, could you please advise the length of rig and hook length, as I would like yo try and make myself – much appreciated. The main part of the rig body is 60lb line about 18 inches in length. The hook length is 30lb Amnesia, which I make a couple of inches shorter. I will put an article up on how to make one, step by step. It is too early to say Paul. I have no idea what conditions will be like then. Keep checking back on the site, as I will have put up frequent forecasts and reports. Hi Sean what are scallop frills? Do you have a pic of them on a rig? I assume it’s the Orange but off a scallop, I love them to eat don’t know if I could justify using them as bait! Good question Andy. I should have explained better. The frills are everything that the fishmonger leaves behind. Basically everything apart from the main body. Often just thrown away by fishmongers. I love free bait. Enjoying your updates, much appreciated. Spent 11am to 4pm at East Lexington yesterday with black lug and squid bait, hoping to get the easterly wind switch. Instead the South Westerly got worse in the day. Caught loads of weed, one clump included 6 leads which paid for the parking! Guy next to us had dogfish, we didn’t get a bite or perhaps we didn’t notice, difficult to tell in those conditions. Keep up the blogs, very informative for beach fishing newbies. That should have read East Bexington obviously, I hate auto corrects! hi sean, I was at abbotsbury, bexy side had nice cod but as soon as darkness fell it was doggie invasion, yet just up the beach hardly any doggies and cod carried on feeding . crazy how just a few hundred yds meant either cod or dogs !!!!!!!!!!!!!!! Hi Sean,along with the Cod reports encouraging even more would be anglers to fish Chesil,could you please encourage people to take their litter and angling related rubbish home with them!.the amount left by a bunch last weekend next to me was unbelievable! it really is getting beyond a joke. Good point Paul. I will try, but unfortunately it seems a lot just don’t care. I agree with you Paul. I was at West Bexington on Tuesday night and it’s so disappointing when we have such a great beach and people leave rubbish on it. Hi Sean, planning a trip to abbotsbury or Portland on Saturday. I’m not a great caster due to a shoulder injury, average around 50-80 yards. Do you think this will be far enough for a chance of cod? Not at the Weekend Will. that’s where I find them. To many anglers think casting out into infinity will get the bigger fish. Not so. Apart from the rubbish, another thing that is really getting on my nerves is the amount of people who will not back fill after bait digging and leave the place looking like it has just been on the receiving end of a mortar stonk. So to those selfish idiots who do this,do me a favour and when bait digging is banned don’t whinge, it is you that will have caused it. This is locals not visitors.